The huge volume of resources needed for sustainable development makes it essential to include efforts of the private sector and of the international financial system. In this order of things, development finance institutions can serve as an important instrument for leveraging those investments. The green bond market has experienced significant growth in recent years that can be attributed to the greater consciousness and consensus that has been created among most countries regarding the need to face up to problems arising from climate change and the associated financial costs. The countries are aware that those environmental problems are proliferating in society and, consequently, that their solution calls for joint action at the global level. It is for that reason that in 2015, after multiple negotiations, 195 countries arrived at a historic pact, “The Paris Agreement,” to fight climate change and boost measures and investments to achieve a low carbon emission, resilient and sustainable future. Implementing strategies to achieve low carbon economies requires growing volumes of financial resources that doubtlessly lie beyond the possibilities of public funds and that would be impossible to finance through taxes or borrowing –even by developed countries. The UNEP Finance Initiative estimates that the transition to low carbon and climate resilient economies would require investing at least US$ 60 trillion between now and 2050. That includes approximately US$ 35 trillion to decarbonize the world energy system by means of renewable energy and energy efficiency; US$ 15 trillion to adapt the existing infrastructure to changing meteorological conditions; and US$ 2 trillion to reorganize global land use into forms that satisfy growing demands for agricultural crops and put a stop to tropical deforestation (UNEP FI, 2018). In the case of the United States, according to the Government Accountability Office (federal supervisory body), climate change has cost taxpayers more than US$ 350,000 million during the past decade. By 2050, that figure will amount to US$ 35,000 million per year. The costs include cleanup and assistance in the case of flood and storm damage, which is expected to increase as temperatures rise (GAO, 2017, p. 1). That huge volume of resources makes it essential for the private sector, and above all the international financial system, to be involved in covering the funds needed for climate efforts and sustainable development. Insofar as mobilizing private capital is concerned, it will be highly important to take advantage of the potential for leveraging public finances, which includes providing financial assistance through financing and incentives and helping to create new sustainable financial markets and put new sustainability regulations and practices into effect (UNEP FI, 2016, p. 15). In this connection, development finance institutions (DFIs) can put their experience in creating new financial markets to work by helping to attract more private sector resources with which to finance the Paris Agreement objectives. DFIs are valuable public policy instruments for getting the private sector to invest in mitigation measures and have created a growing number of financial instruments specialized in doing so. Some of the well-defined actions taken by multilateral development banks (MDBs) in that area have been to issue green bonds. Ever since the first issues were launched by the European Investment Bank (EIB) and the World Bank over a decade ago, the volume of green bonds issued has grown substantially. Although more than US$ 3 000 million were issued in 2012, the volume had reached US$ 142 000 million at October 2018. MDBs pioneered green bond issuance, but corporate issues have grown rapidly. Following the issuance of the first green bonds in 2007 and after the issuance by several national and subnational governments and DFIs, the market evolved rapidly. Over the period 2013-2018, the types of issuers proliferated, with accelerated growth involving growing numbers of commercial banks, non-banking financial institutions (like trusts and vehicles for investment in real estate income) and non-financial corporations (associated with production and the provision of services relating to the generation of energy, transportation, logistics, and waste management, among others), which account for over 50% of the total bonds issued. The EIB has been the largest issuer of green bonds, with a total of 75 issues, giving the bank an outstanding balance of US$ 26 750 million. The World Bank Group is responsible for 219 issues, with approximately US$ 9 880 million in green bonds in circulation; the International Bank for Reconstruction and Development (IBRD), a group member institution, alone, launched 159 issues totaling US$11.4 billion. One of the largest bond issuers in global capital markets, the German KfW Development Bank, for its part, with an annual volume of financing of between US$ 70 000 and US$ 90 000 million, ranks third. KfW has launched 20 outstanding bond issues valued at approximately US$ 16 800 million to date. In the meantime, in Asia, the Asian Development Bank (ADB) launched its first, US$ 500 million 10-year, green bond issue in March 2015, for the purpose of channeling investment funds to its projects promoting low carbon and climate resistant economic growth and development in emerging Asia. Green bond issuance is still very incipient in the region, representing barely 1.87% of total bond issuance at October 2018. Even so, green bonds are gradually ceasing to be innovative instruments in the regional market, as investors demand growing amounts, to such an extent that issues have been launched in domestic markets and in local currencies. Corporate initiatives are not of themselves fully responsible for the desire to place more of these bonds. MDBs and DFIs in general have also given special attention to green bond initiatives and Latin America has not been immune to this trend. This year, the region’s DFIs issued almost 40% of the green bonds, for an equivalent of US$ 454 million. In the region, Mexico heads the list of country issuers of green bonds and in 2015, Nacional Financiera (Nafin) was the first DFI to issue a green bond . The demand reached a level of US$ 2 500 million, equivalent to five times the value to be placed, and the institution was able to place US$ 500 million, with which it was able to finance nine wind energy projects where several private companies started to invest in generating clean energy. The bonds received Climate Bond international Certification issued by the Climate Bond Standard Board and were included in some of the most important international reference indices of both green bonds and emerging markets. As early as 2016, it launched a 2 000 million peso (US$ 110 million) issue on the Mexican Stock Exchange, whose proceeds were earmarked to finance four projects: two mini-hydroelectric plans and two wind farms. Banco Nacional de Obras y Servicios Públicos (Banobras) was another Mexican bond issuer that, at the close of August 2017 came out with a 4 000 million peso (US$ 225 million) bond issue. This is part of a 10 000 million peso sustainable bond issue placement, whose total demand amounted to 23 583 million pesos, or 3.4 times the target figure. The bond proceeds are earmarked to finance seven wind farms, a sustainable transportation project, a mini hydroelectric power plant and other energy efficiency projects granted to 26 municipalities, three wastewater treatment plants and three water supply systems. 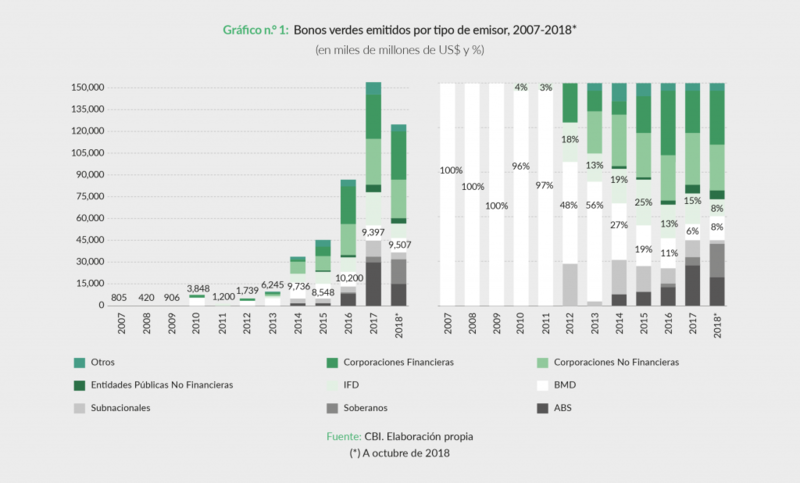 A second green bond issue, for 2 560 million pesos (US$ 137.3 million), came out in February 2018. To conclude the bond issues in Mexico, Fideicomisos Instituidos en Relación con la Agricultura (FIRA) placed the first green bond targeting the rural sector, for a total of 2 500 million pesos (US$ 130 million). The proceeds will be used for a portfolio of 506 projects that will operate in central, northern and northwestern Mexico. The following country by market size is Brazil. In May 2017, Banco Nacional de Desarrollo Económico y Social (BNDES) placed US$ 1 000 million in green bonds in the foreign market. The demand for those securities was five times the target figure and over 370 investors participated. The operation, coordinated by Bank of America Merrill Lynch, Crédit Agricole and JP Morgan, resulted in an investor rate of return of 4.80 % a year, equivalent to a premium of 269.3 basic points over U.S. Treasury bond rates and roughly 60 basic points over Brazilian foreign bond returns. The proceeds obtained will be used to finance environmentally sustainable projects –new wind or solar generation projects or ones already in the bank’s portfolio–, certified by a specialized verification company (BNDES, 2017). 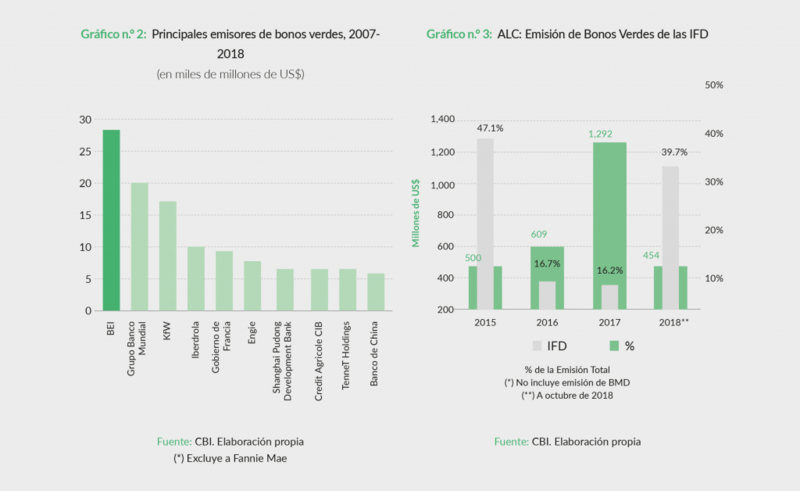 In Colombia, Banco de Comercio Exterior de Colombia (Bancóldex) issued 200 000 million pesos (US$ 66.5 million) of green bonds, with a demand reaching 2.5 times the offering. This is the third institution to issue these securities in the country , but the first to do so in the public securities market. According to Bancoldex, the proceeds were used to grant 328 billion pesos (US$ 107 million) in loans to more than 158 companies. In addition, 273 projects were financed, of which 33% were for MSMEs; the average disbursement was 1 868 million pesos (US$ 608 thousand), with an average operation term of 5.7 years. The institution reports the positive environmental impacts of the projects financed: 22,333 tons of CO2 ceased to be emitted per year, 360 tons of coal were replaced every year by other fuel sources, 788,277 m³ of natural gas failed to be used as a source of fuel per year and 99.80 GWh of electric energy were generated every year by renewable sources. To conclude, the Central American Bank for Economic Integration (CABEI) launched its first green bond issue in 2016. These US$ 72 million 4-year bonds denominated in South African rands (ZAR) added a new currency to CABEI’s funding activities (number 19). With this operation, CABEI became the first Central American issuer of green bonds in Japan. This issue is part of a series of actions the bank is taking to honor CABEI’s Declaration of Commitment issued in April 2016 (CABEI, 2016) by the Bank’s Assembly of Governors to Promote and Support the Financing of Climate Change Adaptation and Mitigation Measures. Banco Nacional de Costa Rica (BNCR), for its part, placed US$ 500 million in 5-year green bonds in April of that same year. According to the bank, the demand for those bonds exceeded the issue five-hold –in other words, US$ 2 500 million in purchase orders were received from investors in Europe, the U.S., Latin America, Asia-Pacific and the Middle East (BNCR, 2016). To conclude, it should be added that in December 2018, Banco de Inversión y Comercio Exterior de Argentina (BICE) announced the signing of an agreement with the Inter-American Development Bank Group, via BID Invest. This consists of a $30 million, 5-year contract to underwrite a bond issue. The proceeds are earmarked for energy efficiency and renewable energy projects, companies led by women, operations supporting development in northern Argentina and the issuance of SME negotiable obligations.